Beginning Saturday January 12, 2019, KODX will begin airing segments formerly heard on KEXPs Mind Over Matters. New shows include Alternative Radio, Counterspin, TUC Radio, Between the Lines, and Making Contact. Eat the Airwaves!, a weekly wrap-up of local, national, and international news with Geov Parrish and Maria Tomchick is also moving over and extending from a 30-minute show to a full hour. 1:00pm – Eat the Airwaves! Thank YOU so much for taking over where KEXP left off– I hope ALL of the “Mind Over Matters” programs can be put onto your station. I am very grateful you are trying to do this, I don’t understand why such highly valuable programs were ever taken off KEXP in the first place. Love the Ralph Nader Radio Hour as an addition!! Also TUC and Alternative Radio, would like to see Prof. Richard Wolff’s “Weekly Economic Update” weekly show added if possible. how do I listen via web? In theory the audio player should launch and begin playing when you go to the website. I clicked on the black & orange box in the far bottom right hand corner of the screen and was able to listen- (in the circle)- but I think this is only available during the hours they’re actually broadcasting… which is not 24 hrs. Hope this is helpful if it doesn’t start automatically. We so very badly need local news and commentary, as well as a radio broadcast of some of the national progressive shows. Thanks much for putting The Ralph Nader Radio Hour on! I would also like to see Richard Wolff’s “Weekly Economic Update” included. Alternative Radio and TUC Radio are longtime favorites, too. Weekly Economic Update currently airs Fridays at 1PM. 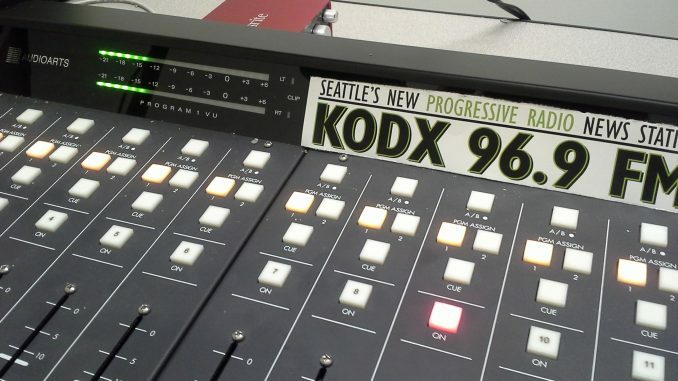 I do not see Diane Horn or Sustainability Segment on either KEXP or KODX. Where oh where is she, and her show? Diane is taking time off to decide what she wants to do at this point. Kuenzli99@gmail.com. Thank you so much! I will be your next faithful listener! Thank for your picking up Between The Lines – we’re truly honored to be part of Michael McCormick’s Mind Over Matters’ lineup of Pacifica Network’s shows in continuing in Seattle!